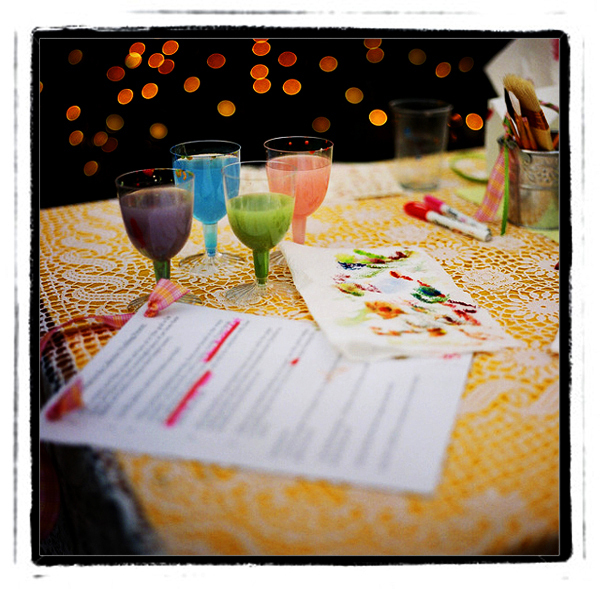 Sweet Things are clever & creative little things that people do, to add a personal touch to their weddings. At a wedding this summer Shawn and Owen asked their guests to contribute to a painting instead of signing a traditional guest book. 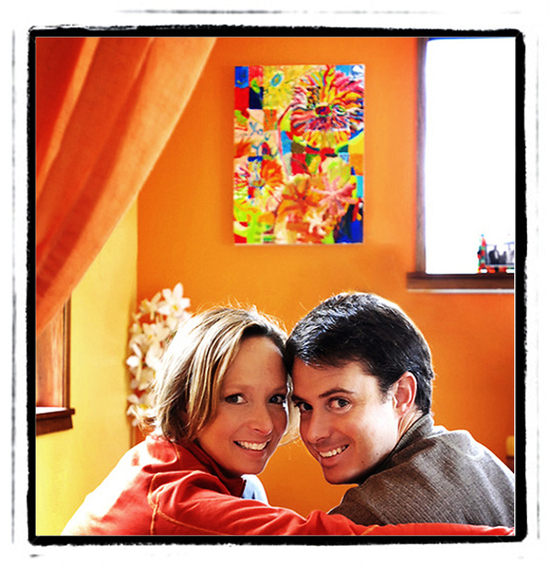 They wanted to have a piece of art for their home that would remind them of their wedding day and all the special people who came together to celebrate with them. They asked their friend Kathleen to act as the "art director" for the project. Kathleen selected an image of sunflowers to sketch on the canvas. Once the sketch was complete she drew a grid on the canvas over the image. 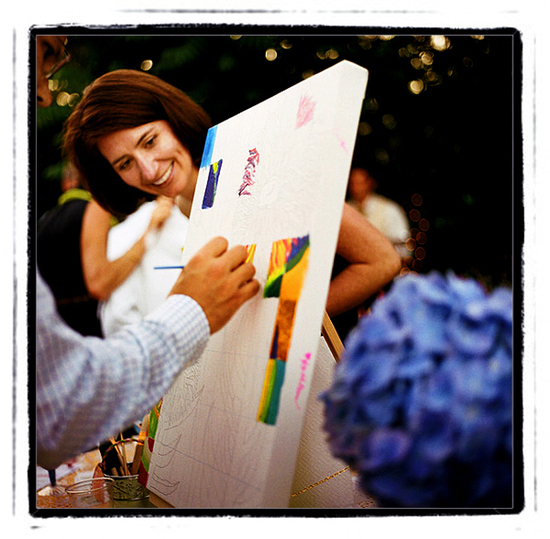 At the wedding each guest was asked to paint one square of the grid. 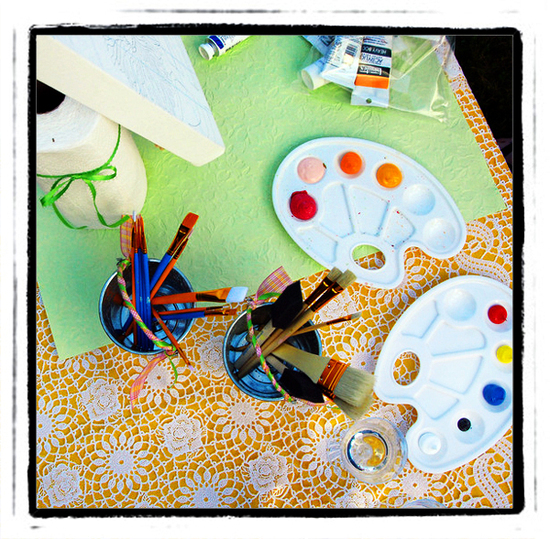 On the cute art table, there was a variety of paints,brushes and directions that explained the art project in detail. While Shawn and Owen sneaked off for photos, they had a lovely cocktail hour planned in the side yard at their Aunt's house. 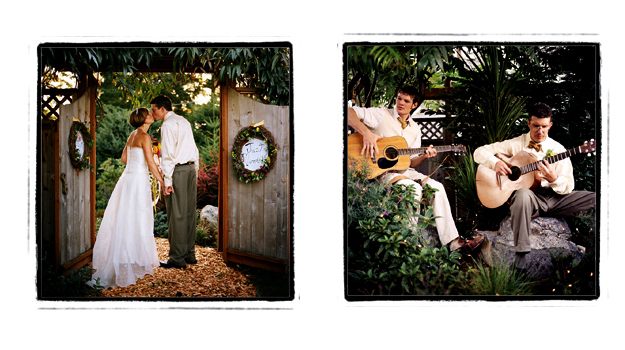 Owen's brother played acoustic guitar while their guests nibbled on seafood and painted away. Kathleen kept an eye on the progress of the painting and encouraged guests who were shy about picking up a brush. After the wedding she filled in the blank spots and then delivered the colorful painting to the happy newlyweds. I asked Shawn and Owen for their thoughts on the completed project. They love the painting and always see new details when they look at it. They said if they were going to do it again, they may limit the amount of paint color choices. I think their bright painting matches their cheerful spirits and home perfectly! I was excited about this project and decided to do it at my friend Cory's wedding. I asked our talented friend Janice to be the "art director". She did a great job taking on the project. 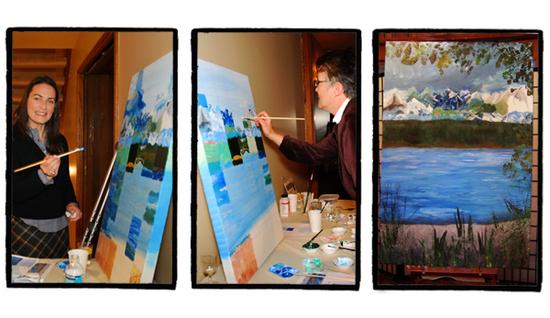 We decided the painting should be the view of the Olympic Mountains and Puget Sound from Cory's Cabin. Janice went to the cabin and took photos of the view from different angles. She then worked her magic on the canvas, sketching the detailed mountain scene. We picked a limited palette of blue and green paints. There was a photo of the view available for people to reference while painting their square. After the wedding Janice smoothed out the squares and added her own artistic touch to the painting. To see more "Sweet Things" for your wedding click HERE and scroll down. this was in brides magazine a few months ago and i was totally smitten with the idea!! love it! I'm going to do this project with a photo of my fiance and I all blown up! This is sooo cute! I love this idea. It is much more personal and creative!! Oh I love those paintings. Another reason for Harry to marry me again!! oh i just LOVE this idea. so creative, so fun, such a lovely way to unify the group to one great big glamorous project. simply wonderful. Thank you Art Directors (Janice and Kathleen) for your input and tips! Much appreciated! You are both very talented women and brave... to take on a project like this! I know it meant a lot to your friends and that they appreciate your efforts! I had a fun thought after posting this...how about guest collage art? You could have a bunch of cool stuff cut out already and ask guests to glue pieces on a canvas. Collage is all about the unexpected so it might be perfect! I'd also suggest that you keep the design relatively simple, some squares in the grid can be more complex for the artistic, but some guests will really appreciate simple "no brainer" squares as well. Thanks for the props. :) The only other thing I would suggest is that the "artistic director" be as detailed as possible in the initial sketch. Or even make it a sort of color-by-number painting. It will help in the overall look and guest will be much more inclined to paint if they only have to follow directions. How totally awesome is that?! I agree, this is a funky cool alternative to the traditional signed mat.